Beautiful java finished wooden jewelry box. This is a sleek design with no exterior hardware. The lift lid has a full-sized mirror and the auto tray contains four sections in addition to multiple ring rolls. Both main compartment and the automatic drawer are open storage, and the entire piece is hand lined in ivory color sueded fabric. Measures a generous 12" x 7 3/4" x 6"
ChasingTreasure.com is an authorized dealer of all Mele jewelry boxes. Since 1912, Mele has been renown for affordable quality, attention to detail and classic style. 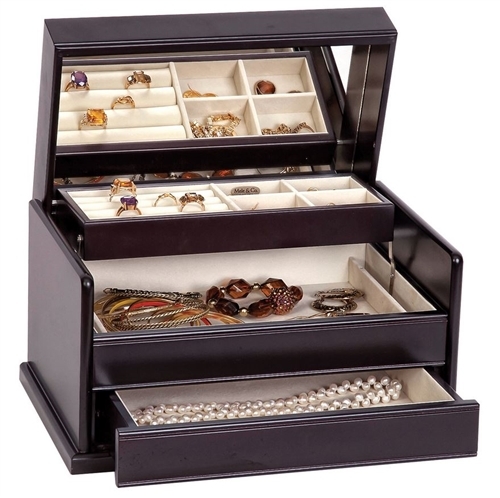 With over 75 unique styles, Mele makes a jewelry box to suit every need and popular styles sell out quickly.